Microplumbers offers contract research, design, and product development expertise in microfluidics. We offer design and development of disposable or reusable cartridges for analytical and diagnostic applications. 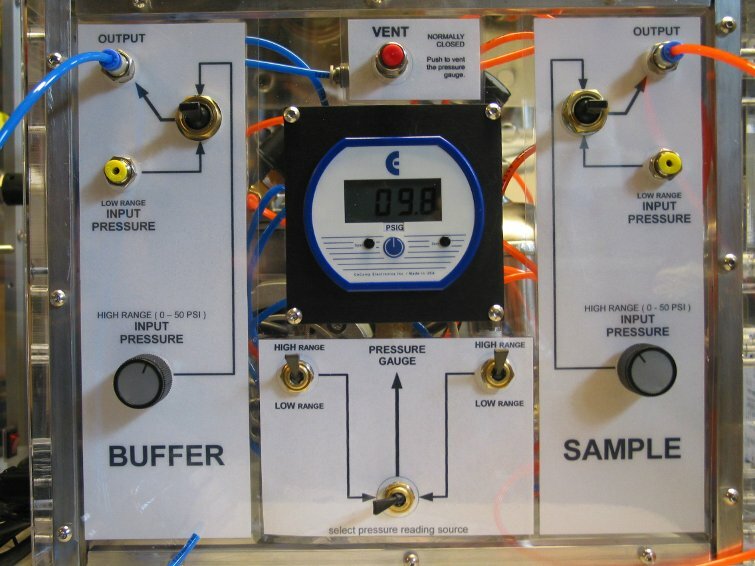 We also develop reusable instruments that control fluid motion and temperature, supply the driving force for mixing and perform signal acquisition and processing. To optimize operational parameters, shorten development time and reduce the development cost, we extensively use Computational Fluid Dynamics and Multiphysics modeling during the design phase. Computational Fluid Dynamics and Multiphysics modeling provide uniquely useful tools to develop microanalytical devices and optimize their operational parameters thus substantially shortening development time and reducing development cost. We apply advanced mathematical modeling tools to solve complex problems of mixing, wetting, heating/cooling, sensing, and chemical reactions. Microfluidic devices are capable of accurately controlling the volumes of fluids in the submicroliter range. Compared to traditional equipment, functional units of analytical and diagnostic instruments designed using microfluidic approaches require much smaller amounts of samples and reagents. 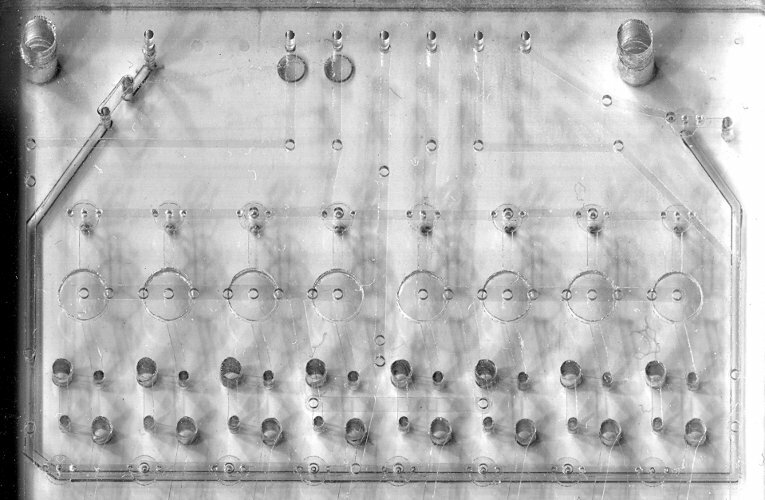 Reactions proceed much faster because of the unique physics of small fluid volumes typical for microfluidic platform. 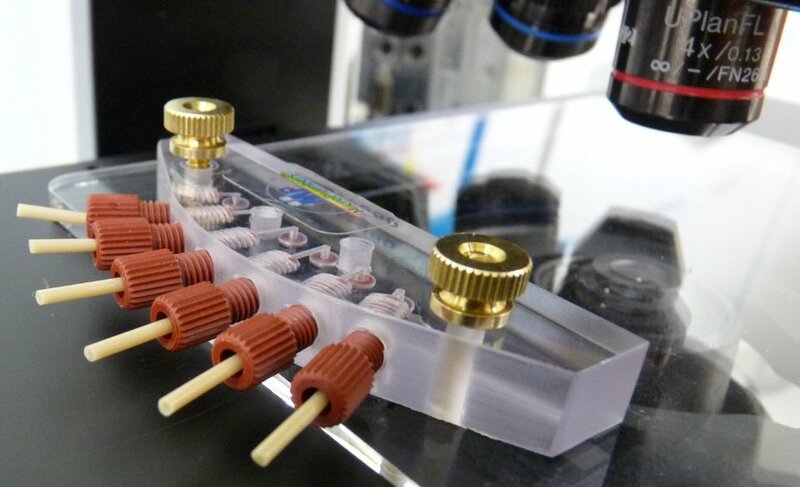 Microfluidic devices are less expensive to manufacture and require little maintenance or space. When used in diagnostic instrumentation development, these features of microfluidic devices permit significant reduction of the time and cost per test. Analytical instruments based on the microfuidic platform, are significantly smaller compared to their conventional analogs. To assist you in developing a desired microfludic device, we will determine your design specifications, fabricate prototypes, conduct performance tests and suggest iterations until design specifications are met. Our preferred method of prototype fabrication is plastic laminates technology. This is a low-cost, rapid prototyping process that allows quick turnaround of design and testing and allows easy inclusion of various functional elements in the cartridge, such as: gas-permeable membranes, cell-separation membranes, fluid control valves, bellows, treated glass slides, optical lenses/gratings/fibers, IC chips, thermocouples, flex circuits, etch-patterned metal sheets, and others. Laminate-based microfludics cards are typically credit-card sized, with most structural element dimensions ranging from 100 micrometers to a few millimeters. We used this approach to build devices varying in complexity from a simple single-component module to complicated fluidic circuits with 3-dimensional microfluidic structures. Laminated cartridges can integrate all standard biochemical analysis steps, including cell lysing, cytometric cell focusing, incubation, nucleic acid amplification, concentration, washing, and separation steps in a single microfluidic circuits. Microfluidic cards typically contain all fluidic circuits and store reagents to perform analytical or diagnostic test. To make them sufficiently inexpensive to be disposable, most complexity is moved to the instrument by which they are controlled. We offer development of instruments that supply controlled fluid motion, operate valves and bellows, and provide temperature control and a driving force for mixing.